You take pride in your work. You take it personally. Maybe it’s time for a multifunction printer (MFP) designed just for you. With its extended services, connectivity, security and workflow app capabilities, the RICOH MP C2004ex/MP C2504ex simplifies how you share information. Use our Workstyle Innovation Technology on the oversized 10.1″-wide Smart Operation Panel to toggle between tasks and jobs with tablet-like precision. Add more customized shortcuts to automate tasks with a single tap. Find helpful guidance via self-help videos, accessible FAQs, interactive screen sharing and more. Access information from the Cloud* and print or share it from your smartphone or tablet. Produce impressive full-color documents. Scan and distribute originals to anybody, anywhere. Protect the device, your documents and data with advanced encryption and overwrite tools. 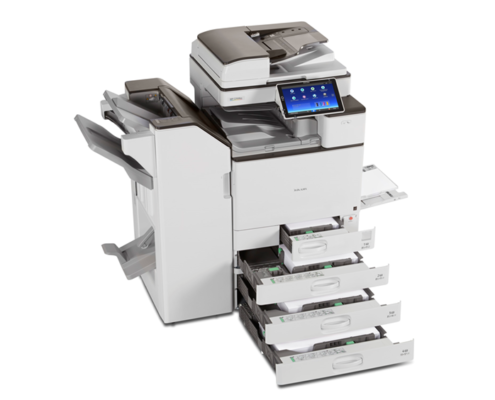 Do it all from this compact MFP that fits perfectly in smaller, shared office environments.